This is Am-Can Ch Schattentier's Boomerang Kid CD CGC (Willie). One of three champions from our 'Maggie' and the Shank's 'Albert', 1992 litter, you can see from his pedigree, 'Willie' has some prestigious SS on his family tree. He started his show career at our 1992 Specialty by winning WD - not bad for a 7 mo old puppy. His striking appearance and sound movement earned him an American and Canadian Championship, quite number of BB and a Group 4th, all before he was two years of age. His excellent temperament and working ability helped him earn a CD in obedience with 3 straight high in class trials. Add to that, a Canine Good Citizen/Therapy Dog recognition and a season of Agility he is perfect example of an all-round SS. In November 2000 he ended his show career by winning Best Veteran and an Award of Merit at the SSCC Regional Specialty - A proud moment for us all. That same day, his daughter, 'Anja', won Best Puppy proving once again, he can produce winners. Now, a senior in our breeding program, Willie lives a life of leisure with Jean and Rick Radley and their wonderful family. Willie still comes 'home' for regular grooming sessions and occasional 'dates' with 'special ladies'. We finished 3 Champion from our 1999 line-bred litter from Willie and 'Sophie'. They were also our first 'Home Bred Champions' and helped us to earn the Pedigree Breeders Award. 'Abby' lives here with us and has proved to be a fine mother. 'Tucker' and 'Jake' you will see below. Willie has produced some very nice puppies for our kennel and for others, including several Champions who are now helping build the future here at Schattentier. This is Ch Schattentier's Knight Music (Spenser). 'Spenser' is a solid, handsome, sweet tempered guy and he showed like a dream. He finished quickly as did his full sisters 'Kari' and 'Holly'. All three were from our 1998 back to back litters with Carla Borrelli's 'Connor' and our 'Gracie'. The weekend we finished Spenser, one of our potential puppy buyers was sitting at ringside. We knew by the look on his face that he just had to have our boy�so, the following week Spenser went to live with his new owners, Dennis, Leanne and Christina Thompson in Thornhill. Spencer returned here in 2001 and sired a litter of 10 beautiful puppies with our 'Reba'. Two of his kids live with us and are currently working on their championships. They are a very nice combination of their parents' attributes. This is Ch Schattentier's Mystic Warrior (Rory). 'Rory' stood out from the rest of his litter mates right from the beginning and has proved to us many times that he was the right choice. He finished quickly with some very nice wins and since then has enjoyed occasional appearances in the show ring and life as the 'king of the hill' here with us. He is the product of a complete out-cross breeding between our 'Reba' and the Davies' 'Sparta' and brings some very fine qualities to our gene pool. He has size, style and grace, along with a lovely temperament, that is being passed on to his offspring. Rory has sired a number of litters for other breeders and three here with us. We are currently preparing 'Whimsey', his daughter from our 'Abby', for the show ring. We are keeping an eye out for a few nice show pups from his latest litter of 9 with 'Holly'. This is Am-Can Ch Schattentier's Nautical Kid (Jake). 'Jake', who was named by his owner's, Gail & David Wilson, for their love of the sea, has proved to be an excellent sailor and is a veteran of Lake Ontario sailboat cruises. He also likes to cruise around the show ring and earned his Canadian Championship quickly. In the Spring of 2002, Jake took the eastern USA by storm earning his American Championship in short order. In his last show, against a fairly large SS entry at Old Dominion in Virginia, he capped off his title by taking the BW rosette and a third 4 point major. With both Canadian and American Championships under his belt, perhaps Jake will try for an Obedience title to go with his Canine Good citizen certificate. You will also occasionally see Jake out having some fun with Dave in the show ring. He is a perfect example of Schattentier temperament, style and conformation. He is certainly turning heads, in and out of the rings, on both sides of the border. We are very grateful to the Wilson's for believing in, loving and supporting this wonderful dog in everything he does. We look forward to puppies from this guy and are sure they will be winners. This is Ch Schattentier's Now or Never (Tucker). If you look at tucker's pedigree you will notice that it says Schattentier's Nautical Kid this is because they are full brothers and so their pedigrees are the same. 'Tucker' finished his Canadian Championship in just a few shows and then went home to live with his family, co-owners Barb and Steve Mallion. He carries some of the best features of both his parents and is a very handsome fellow who just keeps getting better as he matures. He has not yet sired a litter as we are still looking for that perfect girl for him. We look forward to that day. Meanwhile he keeps in shape jogging with Steve. This is Ch Schattentier's Quips N Quotes (Bozley). 'Boz' comes from a trio of fine looking boys in our 2000 litter from 'Reba' and Nonie Lomando's boy, 'Mac'. 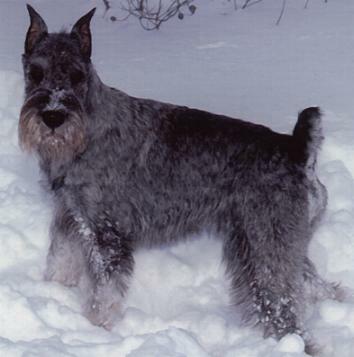 Lovely dark colouring, contrasting furnishing and ease of movement made him a stand out in the ring and helped him finish his Canadian Championship in just a few weekends, including Puppy Group the last day. Bozley's family, co-owners Hugo and Susan Bessems, are now preparing him for a try at his American Ch title. Meanwhile he is muscling up with daily runs on the beach at his home in Port Colborne. We hope to have him back here in a year or so to sire a future Schattentier champion or two. This is Ch Schattentier's Royal Reserve (Zak). 'Zak' is another of our 'Sophie' kids, this time by Nonie Lomando's 'Rhett'. This lovely combo produced 8 pups two of which were shown by us to Canadian championships. Rhett has a prestigious pedigree matched by Sophie's. Their son didn't waste any time proving to us that he also had the right stuff. His first weekend in the show ring at 6 months of age, Zak won a Group 4th. He has followed that up with several more nice wins including RWD against an entry of finished American Champions at our Specialty weekend Booster in Dec. 2001. His sweet temperament, good looks, solid body and effortless movement have earned him many compliments in and out of the ring and a very special place in our hearts. His sister 'Roxie', who now lives with her co-owner Neal Nenadovic in Toronto, will return next year to raise a family of her own. Zak resides with us and is the sire of a beautiful litter of 8 with our Reba. You can be sure, at least one will remain here at Schattentier, to become a future star. This is Schattentier's Top Of The Line (Mason). 'Mason' is just a bit young to be a stud dog but we are looking forward to a litter or two from him in the future. He has grace and style that will only get better as he matures.